Lovely Finca in perfect condition with paved access, panoramic views, 100% privacy and tranquility and located a few minutes to services. Beautiful sunroom converted into second living room with incredible views of the countryside, living room with double height ceiling and fireplace, fully equipped kitchen with laundry area and access to the backyard, separate dining room, 4 bedrooms (one converted into an office) and 2 bathrooms (1 en suite). Exterior: Elegant driveway vehicles with automatic gate and parking for several cars. 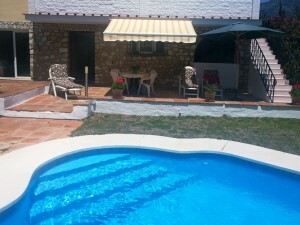 Heated pool surrounded by terraces, barbecue house and pergola with dining table. Property in perfect condition with air conditioning and heating in 3 bedrooms and living room. Under floor heating in dining room and office. Own well water with large water tank. Garden with automatic irrigation system. Plot 5.383m2. Total built size 280,09m2. Living area 147,85m2 plus terrace 48,85m2, machine room 20,60m2 and water tank 63,60m2. Pool 36m2. Rubbish 76? per year. IBI 439? per year.